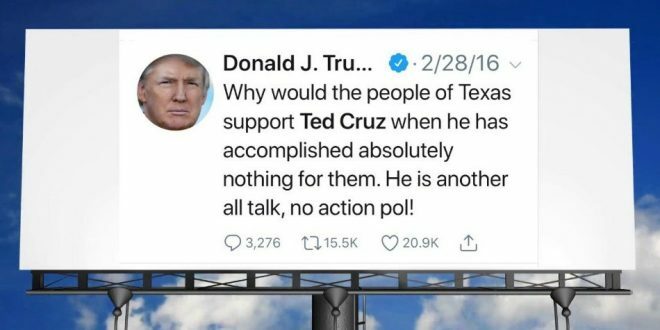 Texas Billboard To Display Anti-Cruz Trump Tweet - Joe.My.God. Activists in Texas have raised thousands of dollars to place an anti-Sen. Ted Cruz (R-Texas) billboard in the state. A GoFundMe page organized by USA Latinx, a political group focused on supporting Latinx candidates, topped its $6,000 fundraising goal, raising nearly $10,000 in less than 24 hours. On Friday, the president tweeted that he would be holding a “major rally” for Cruz next month. Several recent polls have shown Cruz and O’Rourke in a dead heat, though the deep-red state has not elected a Democrat to the Senate in three decades.